Got Ears?® Ultra Lightweight Stereo Headphones are just the right product for kids who are not yet ready to appreciate (or care for) an expensive high fidelity headphone. These great little lightweight headphones work well in the workplace or gym too. At this remarkable price point, you will be amazed at the clarity of sound they produce. 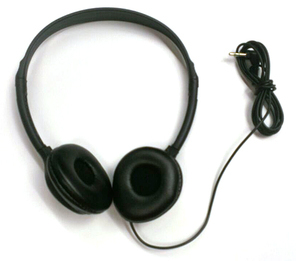 Equipped with a standard stereo mini plug (3.5mm, also known as a 1/8" stereo plug), Got Ears?® Ultra Lightweight Stereo Headphones work with virtually any portable AM/FM radio, ipod, scanner, FMRS radio, or computer. And they are so inexpensive, you can give them away to customers on the plane, at the spa, gym, or learning center. Got Ears?® Economy Headphones are equipped with nicely padded foam ear pads for all day comfort, an adjustable headband to fit most people from kids through adults, a 42" quality cord with strain relief fittings at both ends and a 90 degree plug.